Whether training, maintaining or problem solving with your barrel horse you will be using different tools to reach your goal. Keeping an open mind, we are able to add more tools and resources to our toolbox. My training toolbox is full of drills and exercises that target the moves we need to execute a barrel pattern. I use exercises to train young horses, maintain and enhance the horses in the seasoning process and to sharpen up and strengthen the experienced horses. One of the drills I use to cover all of these bases is a drill I like to call “Circle Tires”. Essentially, we are circling tires, but it isn’t that simple. When done correctly and precisely it can actually be quite challenging. 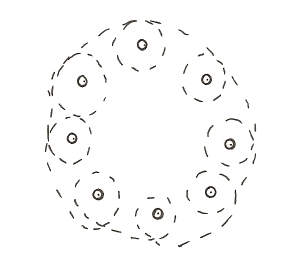 Place tires in a circle that is approximately 50 ft across. You can give or take 10 feet depending on what you have room for. I like to use bicycle tires because they are easy to move around and don’t get full of water like cars tires do. 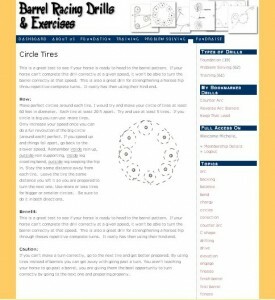 Use 5 – 8 tires to make your circle depending on what you have room for. Try and have the tires at least 20 feet apart. The closer they are to each other the more challenging it will be. Use from 5 to 8 tires and make your circle as big as you’d like. The objective is to make perfect circles around each tire. Only increase your speed once you can do a full revolution of the big circle (around each tire) perfect. The level of training your horse is at will dictate the size of your circles. The lower the level, the larger your circles should be. If you are using this drill to relax your horse in a turn, bigger would be better. If you are working on maneuverability, you might do them different sizes. When you are starting out at a trot and lope, you may have to skip a tire to be properly prepared to turn the next one. Your body position should have your inside rein up and guiding, outside rein supporting, inside leg creating bend, outside leg keeping the hip in. Stay the same distance away from each tire. If your horse is diving for the turn, go out wider and make him stay out. Leave each tire the same distance you entered it so you are prepared to turn the next one. Use more or less tires for bigger or smaller circles. Be sure to do this drill equally in both directions. A more advanced version of this drill would be able to do it correctly with one hand on the rein in the turns (like a barrel turn). Doing this drill with young horses is a great test to see if he is ready to head to the barrel pattern. If your horse can’t complete this drill correctly at a given speed, it won’t be able to turn the barrel correctly at that speed. This is also a great drill for strengthening a horses’ hip through these repetitive complete turns. It really gets them using their hind end. If you have a horse that over works or crowds you in a turn, this is a great drill to get them relaxed in a circle and works on their maneuverability in a turn. It is more important that you are prepared for the turn, than catching the turn at each tire. If you speed up and things fall apart, go back to the slower speed. Only turn when you feel you have properly prepared your horse for a successful turn. If you aren’t happy with your turn, consider doubling up and circling the same tire again. Adding this exercise to your toolbox or digging it out for reuse is a positive step to a softer, stronger, more responsive horse. Improving these qualities on a drill will carry through to your next race or the next time you do barrel work. A smooth running soft turning horse is efficient, and the clock will tell you so. To learn more of the drills and exercises I use to train and maintain my barrel horses check out the website www.barrelracingdrills.com where you can access over 80 drills and exercises for barrel racers looking to improve their horsemanship and times. Glad you got something out of it Fran 🙂 I picked all mine up from the local dump over the span of a few weeks. I picked up a few each trip to the land fill! I think a bike repair shop would also be a good place to pick up some old ones. I picked up a dozen light motorcycle tires from a local dealer/repair shop. They had an old cage in the back and were HAPPY to have me take some. They have to pay to have them hauled off. i really like this excersise! i have done it before but with using barrels, ill give this a thought and try it out! I have a 3 yr old mare and we have been doing slow work on the pattern for about 1-2 months. Would like to take her to a few competitions this fall, just to get her out a little bit more. Would it benefit her to do the barrels (slow) at these competitions? The exposure would be great for her. I would just make sure it isn’t too much or upsetting for her. The first time you go maybe plan to just hang out and walk around and get her used to other horses before you go in there on your own. If you only go as fast as she can do correctly and confidently you shouldn’t be doing any damage. If you plan to futurity her, do be aware that once you enter an event you may be affecting her eligibility. Futurities don’t allow competition prior to Dec 1. You could enter exhibitions and other events, but no barrel racing to keep her eligible.